The following block diagram can be made from circuits elsewhere on this site by following the various links. As with the Wein bridge oscillator there are two capacitors per range and a dual gang potentiometer is used for tuning. 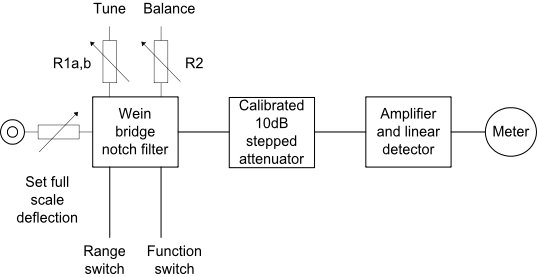 Sufficient gain must be provided so that distortion products may be sufficiently amplified to indicate on the meter. For example, if you require to measure 0.1% distortion then at least 60dB gain will be required after the notch filter.